KCP Demolition Ltd has been established since 1983, during this period the company has worked and joint ventured with both UK and US major contractors specializing in the demolition industry. In most cases KCP have not sought to promote its own identity. KCP have vast experience in dealing with all aspects of demolition. KCP have been the operational core of six major UK Companies in the past 20 years that can be demonstrated to any prospective client. KCP Ltd has evolved from a core business set up in 1983, namely KCP Demolition Ltd. KCP Demolition became experienced in main line demolition and recycling and soon established itself as a diverse company dealing in urban regeneration and large scale industrial Demolition. The company over a period of time developed close links with certain government departments and main stream clients many of which we still retain as clients, our relationships were borne out of our total commitment to ensuring that the contracts entrusted to us were completed on time and within budget. During this growth period we developed a specialist team to undertake works globally and have over the past two decades undertaken contract for both the UK government and the US core of engineers. Ours is an active role, not a passive one. We provide a dedicated and comprehensive management service to control our clients projects which is tailored towards achieving their specific objectives at all stages of the demolition / construction process. By managing the whole process for our clients, we not only provide continuity of service but also the potential to reduce programme and cost through considered sequencing of the project’s phases. The Directors of KCP Demolition Ltd have extensive experience in their respective fields and have delivered complex, multi million pound projects to a wide range of clients within the demolition and construction industries. Couple this with our excellent safety record and it’s easy to see why KCP Demolition ltd is a favored contractor amongst our Clientele. "I would have no hesitation in recommending KCP". "Please pass on our thanks". "Awarded Contractor of the Month". "Overall a very good Audit". We are committed to working towards common systems of operation through the achievement of separate but conjoined internationally recognised standards of operation. These include UKAS ISO 9001 / 14001 and OHSAS 18001 in the future..
KCP Demolition Ltd are committed to providing the best possible standards of quality for its services and are dedicated to maintain a Quality Management System, which ensures that its services meet client requirements within the agreed parameters of cost, quality and delivery. The company is extremely proud of its reputation for dedicated client care, which is a result of the company’s skilled committed staff and quality control over its services. 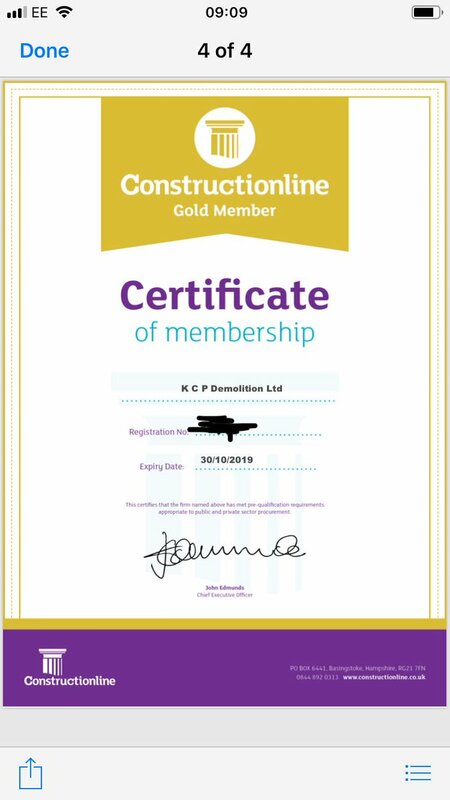 KCP Demolition Ltd are a BS EN UKAS ISO 9001 / 14001 Accredited business and maintain this rigorous quality standard through registration and continual review. KCP audits its operational Health and Safety performance through both internal and external audits and has an enviable operational health and safety record. We maintain 100% CSCS accreditation for all field staff and office staff who attend site. Working extensively within the Demolition / Construction industry, the company’s’ health and safety standards are understandably high. These standards and procedures extend into all aspects of KCP’s operational activities. On all of KCP Projects, HS Direct and Prime Safety provide 24/7 support for safety matters. At KCP Demolition Ltd we aim to seek a lasting legacy, which creates value for our clients with minimal short-term environmental impact; while relentlessly pursuing, through better design and engineering the longer-term goal of excellence in terms of environmental performance. Waste management initiatives designed for the needs of our projects and mindful of the impact on landfill sites are in place; energy conservation initiatives and the use of environmentally sustainable materials are pursued wherever practicable. Within our Environmental Management System we have set out a series of challenging targets appropriate to the industry. These include proactive solutions to minimise environmental impact and the risk of pollution. KCP’s Operational Management will have received training in Site Waste Management Plans / WAMITAB NVQ Level 4 Managing Transfer Operations and all of KCP Demolition Ltd employees will have completed environmental awareness training during the same period. All activities are undertaken on behalf of our clients and are performed in accordance with our EN ISO 14001 Environmental Management System. This system helps us to integrate an environmental agenda into all our client relationships.